Former Oregon Ducks forward Kavell Bigby-Williams played the entirety of the 2016-17 season while under criminal investigation for sexual assault. According to a thorough report by the Daily Emerald, Bigby-Williams has been under investigation by Northern Wyoming Community College District campus police since mid-September. He played basketball for Gillette College, a junior college in the NWCCD, before enrolling at Oregon. The 21-year-old is accused of sexually assaulting a woman in an off-campus apartment near Gillette on the night of September 17, days before he began his first semester at Oregon. Bigby-Williams announced earlier this week that he will transfer from Oregon to LSU. He first declared his intention to transfer two months ago, shortly after Oregon lost to UNC in the Final Four. Public records obtained by the Emerald show that University of Oregon police have been aware of the investigation of Bigby-Williams since at least late September, about a week after NWCCD campus police first opened it. An Oregon campus police detective unsuccessfully tried to interview Bigby-Williams twice before his attorney told her not to contact the basketball player anymore. UO police reported that order to NWCCD police, who did not ask them for further help with their investigation. 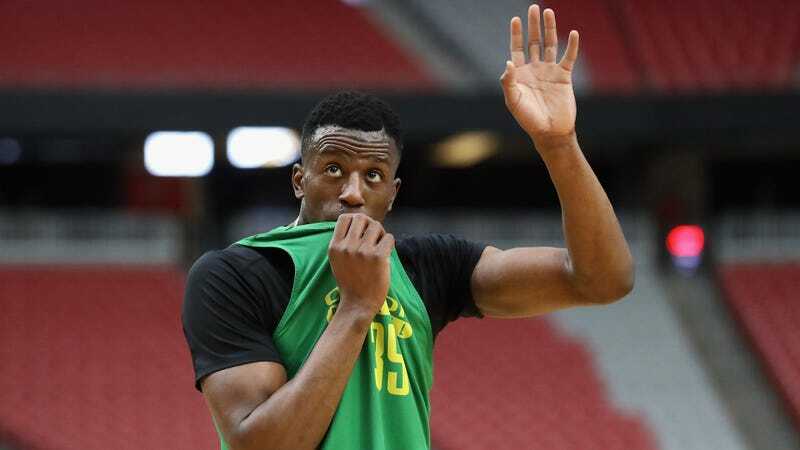 Oregon’s athletics department told the Emerald that head coach Dana Altman and athletic director Rob Mullens, along with other staffers, knew that a police detective had been trying to get in contact with Bigby-Williams. The department claims that no one knew exactly why or what the nature of the case was. When approached by a reporter with questions about Bigby-Williams, university president Michael Schill said he had not been aware of the allegations and declined to share more, instead comparing being under investigation for sexual assault to being a reporter asking “obnoxious” questions. The university’s basketball program is only three years removed from allowing a trio of players—Dominic Artis, Damyean Dotson and Brandon Austin—to play in the NCAA Tournament while under investigation for allegedly sexually assaulting a female student. Austin had been under a separate investigation for sexual assault at Providence before being recruited to transfer to Oregon. Altman came under fire for the decision to let the three play, claiming that he knew an “incident” was being investigated but didn’t know which players were involved or why. After the district attorney’s office dismissed the charges, saying that “while there is no doubt the incidents occurred, the conflicting statements and actions by the victim make this case unprovable as a criminal case,” the alleged victim sued both Oregon and Altman. She settled for $800,000 and free tuition in 2015. Though Bigby-Williams announced his intent to transfer to LSU this week, he has yet to officially sign. He will have to sit out the 2017-18 season under NCAA transfer rules. Update, 12:10 p.m. ET: Oregon has released a statement about the situation, saying that there was “insufficient information to warrant interim action” in September 2016 and that there have been no further updates from NWCCD police to merit action.